Like exercise, proper nutrition provides a wealth of benefits‚ both physical and emotional‚ that contribute to your body's strength and its ability to ward off disease and disability. A healthy diet translates into a healthy body; the proper mix of vitamins, minerals, and other nutrients are the best recipe for ensuring that your skeletal, muscular, nervous, and circulatory systems function smoothly. Ample amounts of water are essential from a dietary standpoint. Water keeps your cells hydrated and helps your blood work more efficiently in carrying nutrients throughout your body. Tea, coffee, sodas and alcohol actually have the opposite effect. Drinking excessive amounts of soda and other carbonated beverages could interfere with calcium absorption, which may lead to bone loss and osteoporosis. Calcium (in milk, broccoli, salmon, and kale) keeps your bones strong. Choose foods rich in fiber. A good rule to follow is an intake of 25 to 30 grams of fiber per day. Foods rich in fiber include whole-grain breads and cereals, beans, nuts and some fruits and vegetables. Foods high in Vitamin C (such as broccoli, bell peppers, citrus fruits, cabbage, cauliflower, spinach, and strawberries) help ward off osteoarthritis. Vitamin B and amino acids may help reduce the pain from contact sports. Thiamine can help promote healing. Also consider Vitamin A to strengthen scar tissue. Fortified dairy products and fish rich in Vitamin D help preserve your cartilage. Raw foods retain vast amounts of minerals and other nutrients, which are destroyed or diminished by the process of cooking (canned tomatoes are the rare exception here). 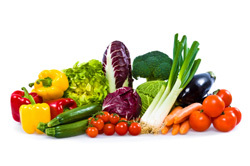 Eat the skins of fruits and vegetables because they often contain more nutrients than what's inside.